Leucocarpa, also called Leucolea, is an olive variety characterized by small fruits which, during ripening, take on an ivory-white color. “Mainly widespread in the regions of southern Italy, with a strong presence in Calabria, it was probably introduced during Magna Graecia’s colonization,” Innocenzo Muzzalupo, a researcher at the Council for Agricultural Research and Economics, Research Centre for Olive, Citrus and Tree Fruit (CREA-OFA), told Olive Oil Times. “The extra virgin olive oil made from this variety has the same characteristics as all the others with regard to the composition of fatty acids, flavors, and aromas typical of a light fruity product,” he clarified. “A small number of producers use it in blends with other predominant cultivars, but due to the white color of fruits, which in western culture symbolizes purity, it ended up being used mainly for religious purposes.” That is why Leucocarpa is often grown near convents, where its oil, after receiving a blessing, is intended for the sacraments and other Catholic rites and, in the past, to anoint the emperor during the coronation ceremony. This is further evidence of how ancient people, independently of their creed, associated the olive tree and olive oil with sacredness, as happened in Athens, and many other places throughout the Mediterranean basin, to such an extent that nowadays the olive tree is universally considered a symbol of peace. Going back to Leucocarpa, genetic characterization established that it belongs to a unique strain, whose limited spreading is probably due to uneasy propagation. Then, farmers take good care of these olive trees, which during fruit-bearing season give a ravishing aesthetical effect, which according to a study conducted by Muzzalupo with other researchers of CREA and the University of Calabria, is due to a “switch-off” of flavonoids and anthocyanins. We should recall that some varieties, during the first part of drupe ripening, takes on a very pale shade of green which is nearly white. 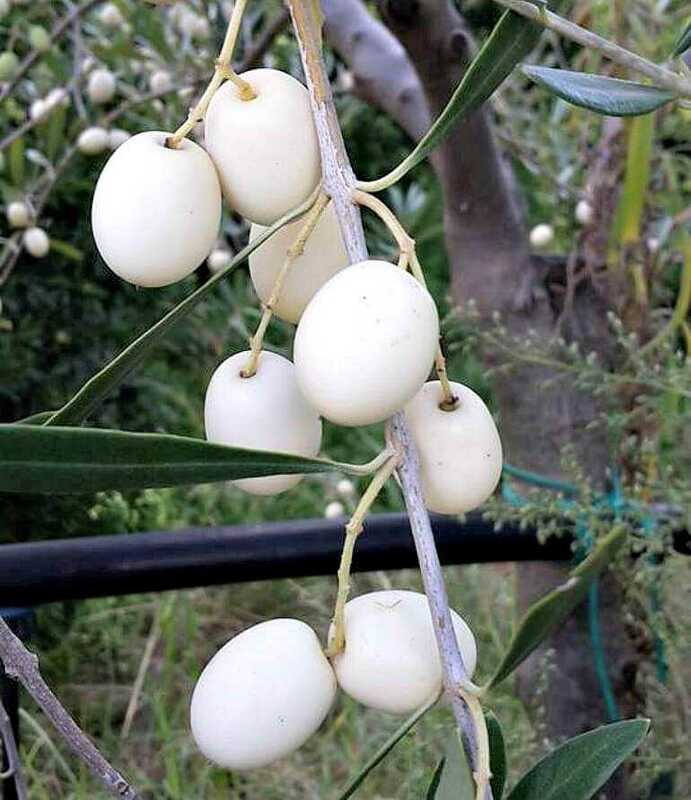 For example, Biancolilla, whose name recalls the color white (Bianco in Italian), is improperly called Leucocarpa in some areas, because after chlorophyll degradation, fruits remain light-colored even twenty days until the pigdos are activated. “The characterization of transcripts from flavonoid and anthocyanin biosynthetic pathways and the analysis of their expression level in olive fruits is an important goal, not only to understand the veraison event of fruits, but also to increase the knowledge on these antioxidant molecules, which are important for human health,” Muzzalupo noted. He also reported the result obtained by milling this variety with a Keurig-like device called Revoilution.